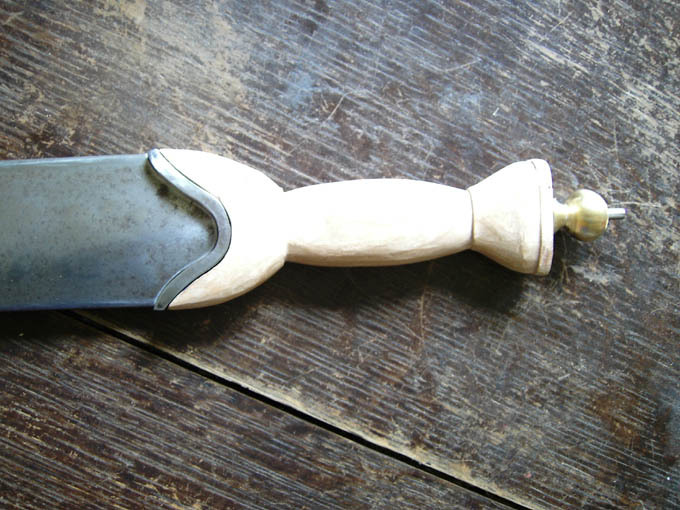 Getting the leather to seat properly over the rounded surface can be a tricky task, but I was able to stretch leather over the bottom of a seax handle that had a domed bottom that was slightly rectangular. 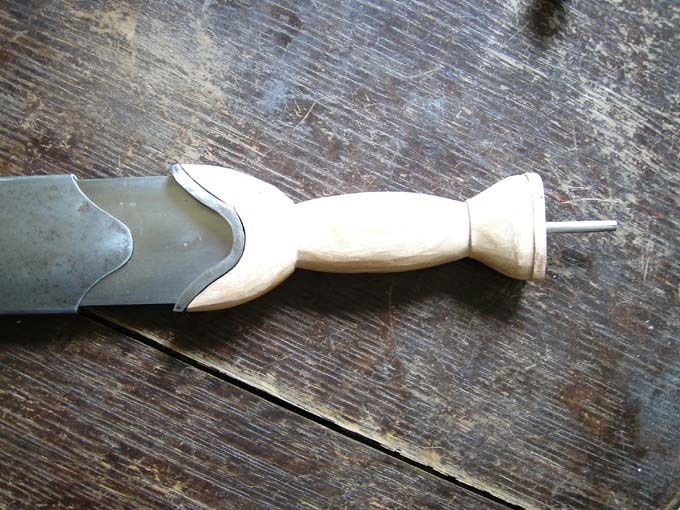 I used a similar groove as the one seen in your pommel to secure the leather with a piece of cord while working the wrinkles out of the leather. 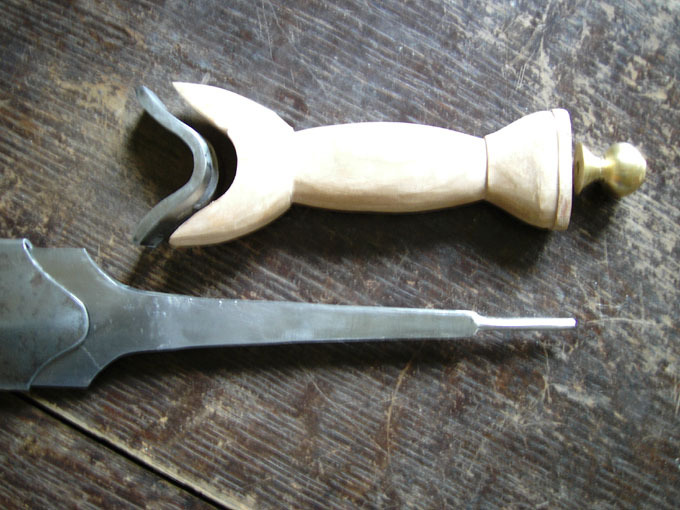 I think technically speaking the pommel shape and groove include all the component to ease the process of applying the leather. It would be interesting to know what, if anything, was placed inside of the grooves since that is where the two edges of the leather would come together. 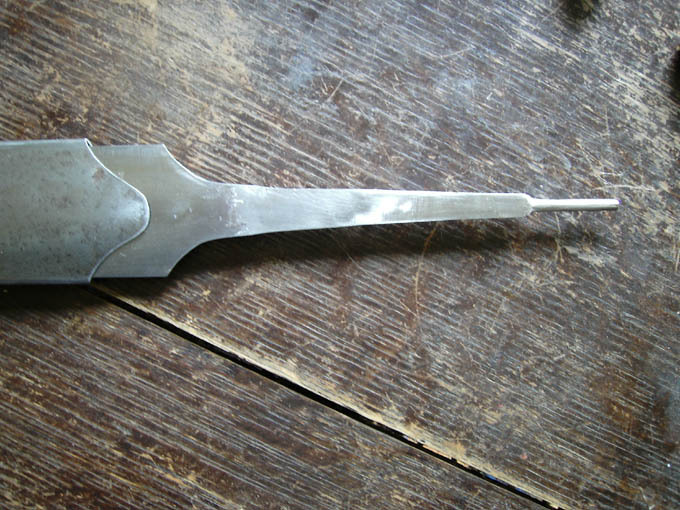 In my case I inserted a twisted wire and got a fairly clean look. 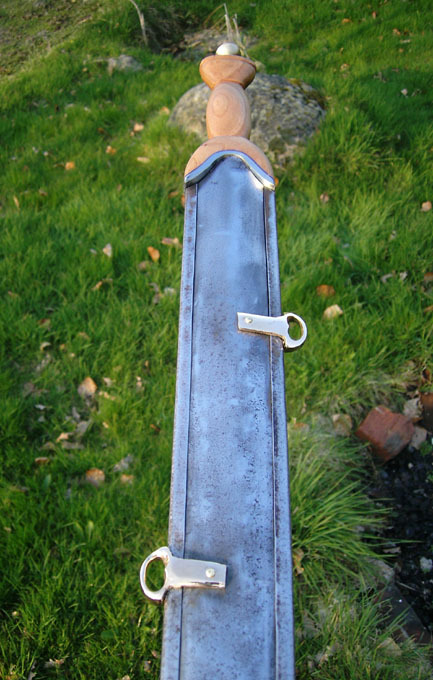 Very nice job on the hilt and the overall blade I've really enjoyed this thread and seeing your work! 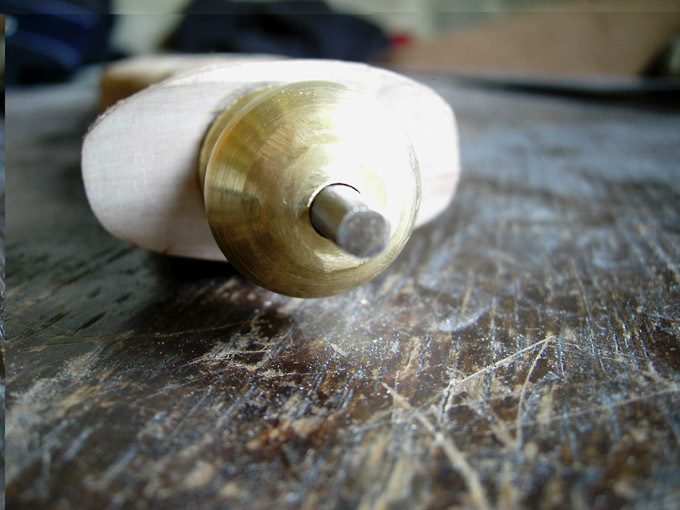 I think technically speaking the pommel shape and groove include all the component to ease the process of applying the leather. It would be interesting to know what, if anything, was placed inside of the grooves since that is where the two edges of the leather would come together. That is the question!! 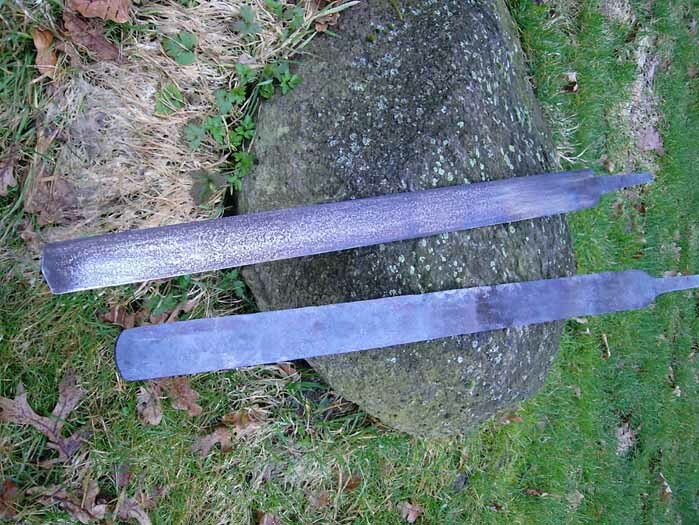 Could have been an iron ring, because the iron dissapeared in the Thorsberg-bog, same happened to the sword-blades there. So iron would be a reasonable possibility! 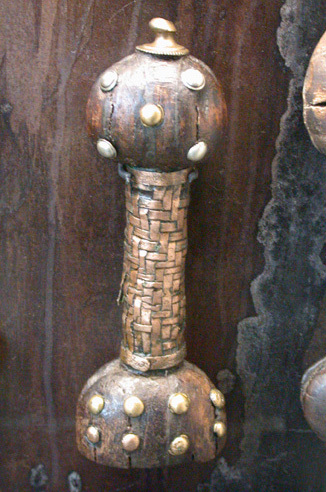 Only the grooves could have survived of it....BUT: There are also such pommels without grooves but with similair rivets! 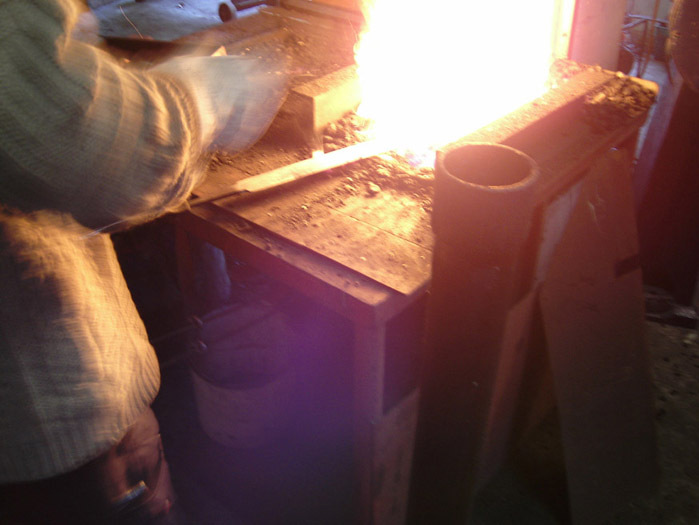 ....and: you would in such cases see a speciality at the bottom of the brass pommeI-crown (don´t know the right word for it, the brass piece where the tang-end is peened over) or at the top of the pommel, where the iron ring must have been devided to let the tang go through. 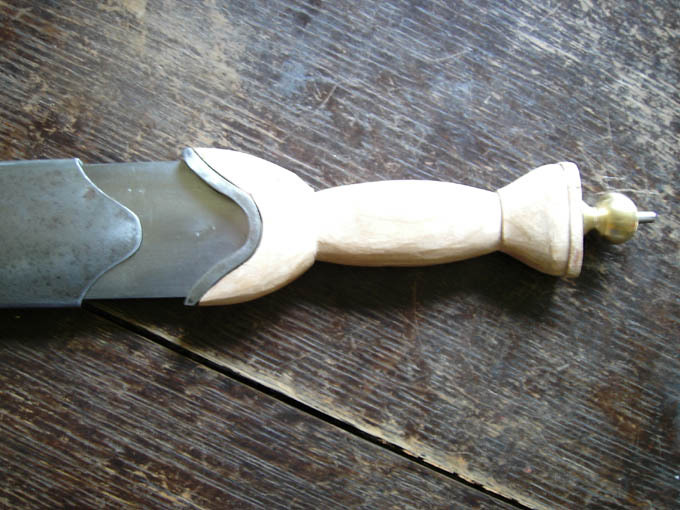 Same at the top of the guard and the bottom of the hilt. 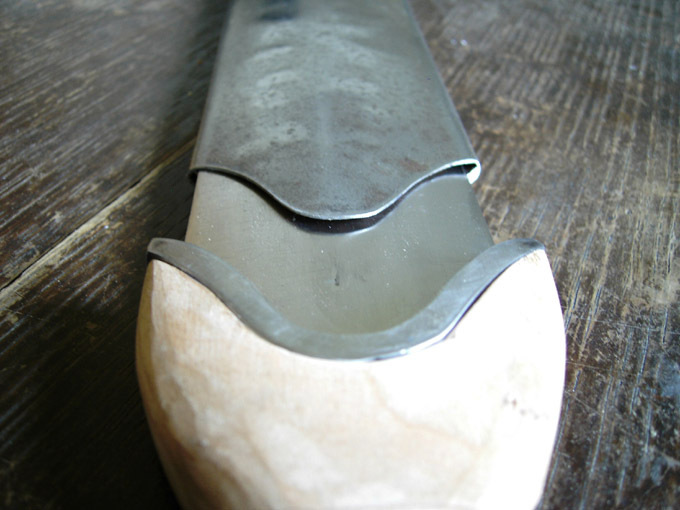 If not the wire had passed through the hilt-hole alongside the tang and surrounding the pommel to get back down alongside the tang to finally surround the guard to be finally fixed between the shoulders of the blade and the guard (which I think is possible). Nevertheless: I like it without leather also! I think that leather cover may have been common, but I think not universal. 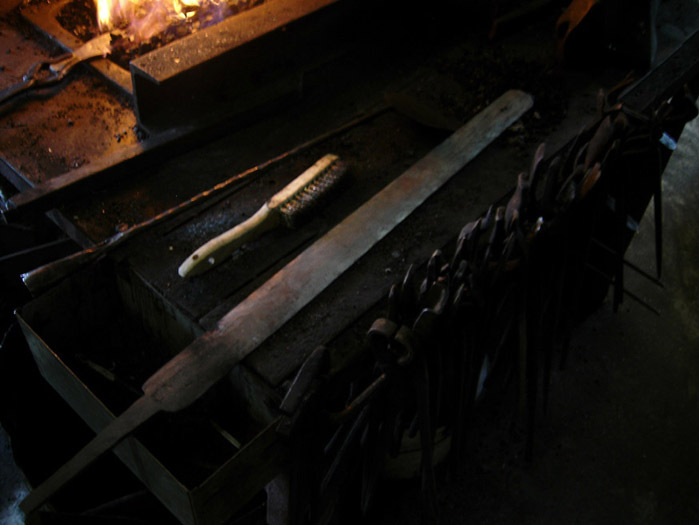 I also think that the grove was used for the two edges of leather to meet in a handy way and as a secure place to keep a cord while the glue and leather dried. As it has set, you do not really need something in the grove. The imprint of the cord will look like some of the press blech decorations you see i in those pommels and guards that are made in silver/bronze. 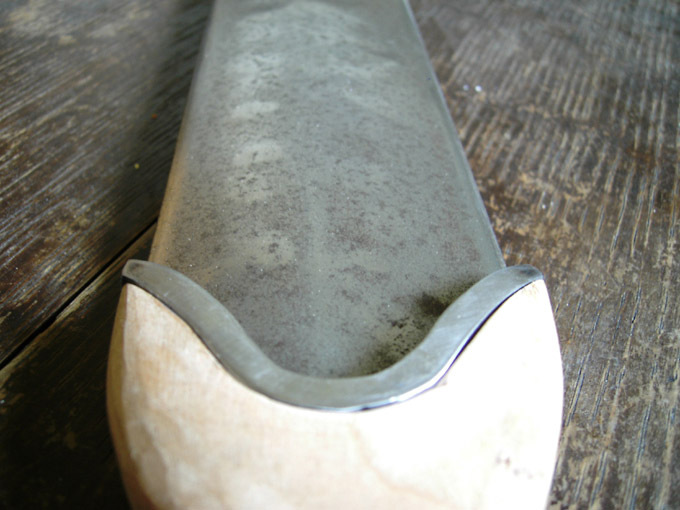 SOme hilts have those narrow strips of iron sheet metal fastened down with small tacks. They are another version of solution to this problem of keeping the leather in place and wrinkle free. Some more experiments with reconstructions will give us more ideas, I´m sure! Christian, I have actually thought about this as well! The "pouch" from bulls or he goats would fit the bill very well! It was used for small bags, was it not? 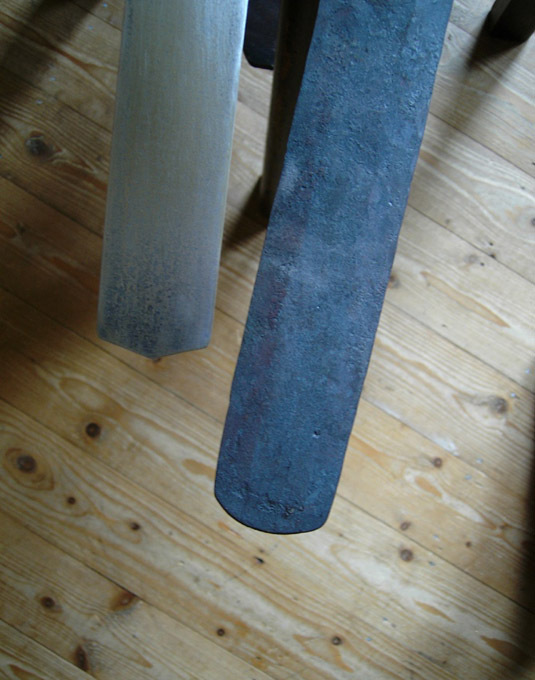 Otherwise I´d put my money on gut leather, as raw hide, no tanning. This is the reason why "normal" people call us mad, WE ARE NOT, WE ARE TOTALLY INSANE!!! 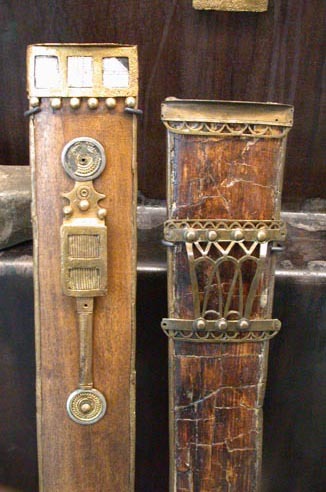 I would like to replikate or craft item inspired by the find, which is now in Schleswik museum. Its not my usual interest period so i am little confused. Could you chime in and advice few things? 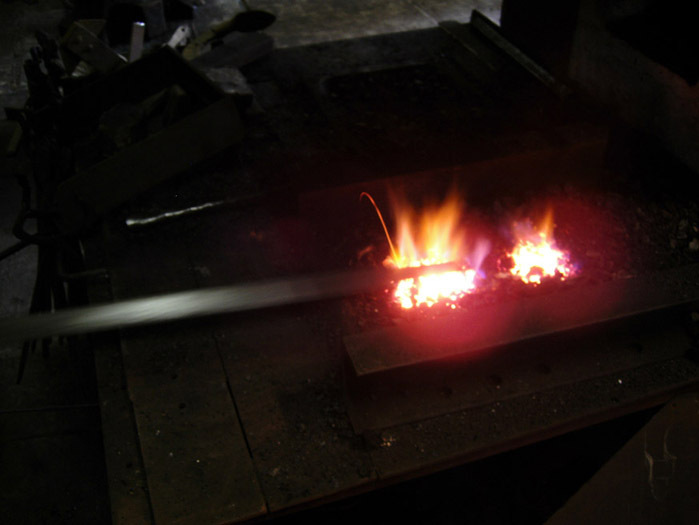 a sword is very similar to Pompei (southern Italy) 24 agust 79 A.D. Vesuvius erupted. 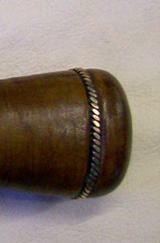 This pic shows the hilt before it was finished with bee´s wax, looks much better now. I have to correct my information on the Spatha of Pompeii. found; the earliest of Nero, A.D. 60, and the latest of Septimus Severus, A.D. 194.... "
Fig. 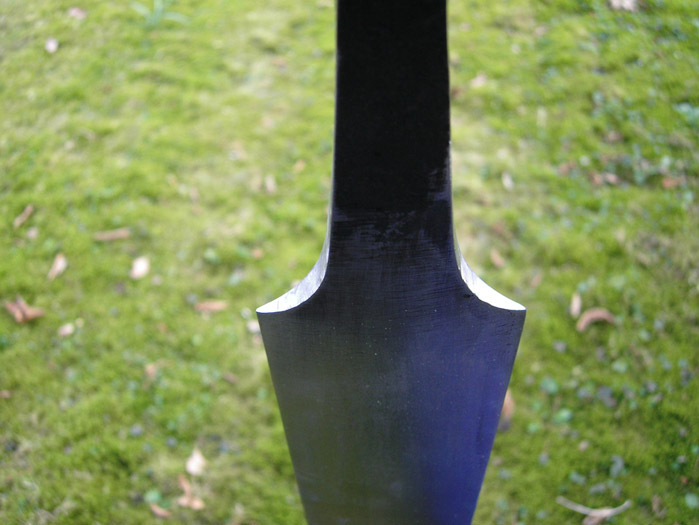 37 refers to the same sword which is discussed here. 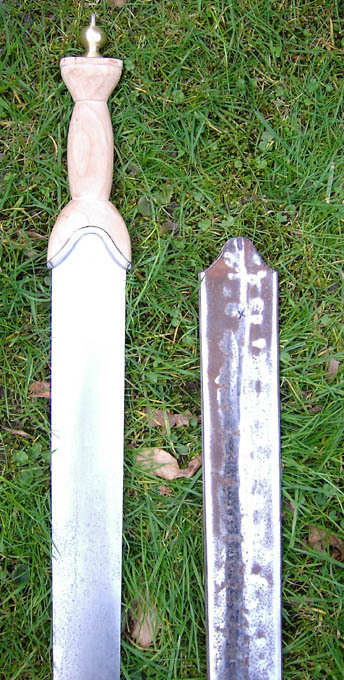 the hilt mentioned at the beginning refers to other swords. I checked, there is no grip interlaced with bronze in Pompei. 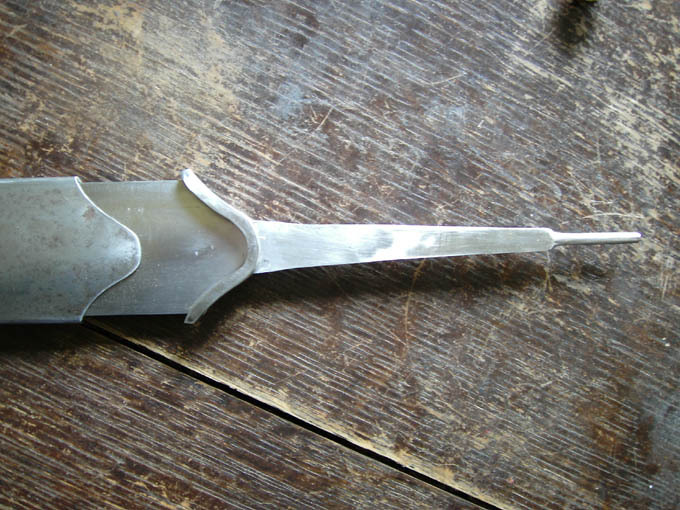 before tempering the blade had to be re-straightened from bending, this had to be done inner a few minutes. If done it too long, it would have broken. Great work of course! I appreciate the step by step pics, Christian. We can visualize the processes involved in creating these replicas and find inspiration in them and the history they represent. For those of us watching this thread the time delay is not an issue (for me I should say) since we get an email notification of the next post. 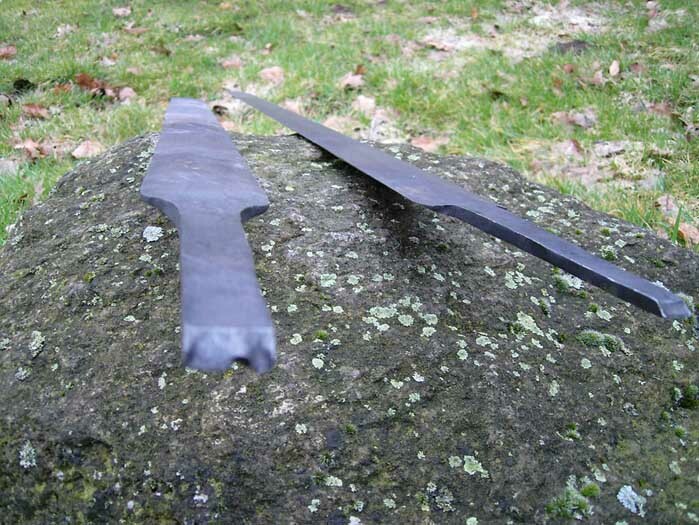 Not common to see these shortish, blunt ended swords reproduced. 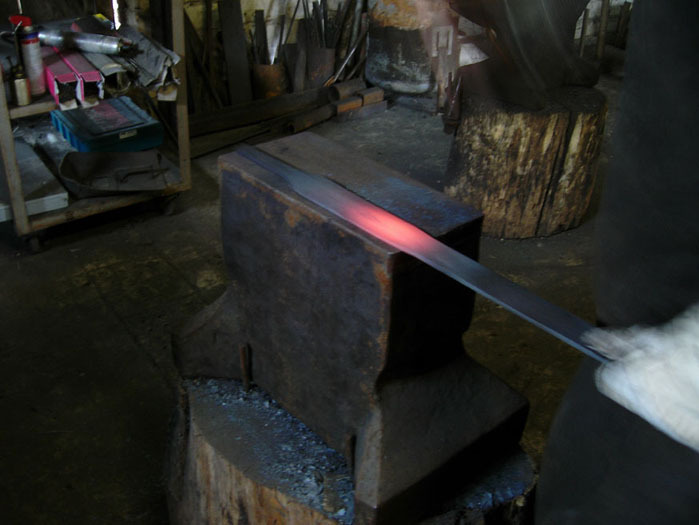 It shall be a beautiful sword when it is done. 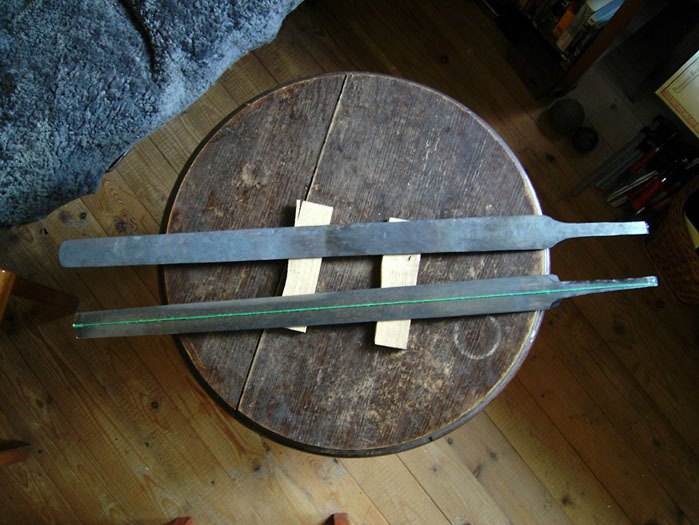 Hopefully I will get opportunity to make a germanic/celtic blade of late 1st C BC/ early 1st C AD soon. I will try to take photos and add to this thread. 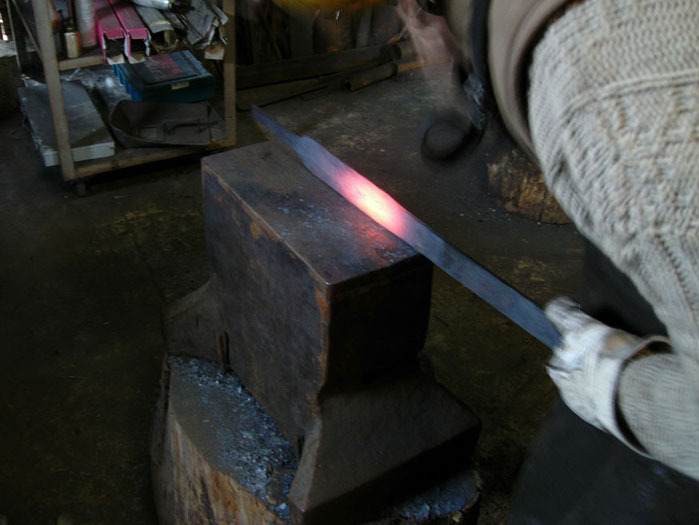 Looking forward to see your sword take final shape. I would not mind myself! 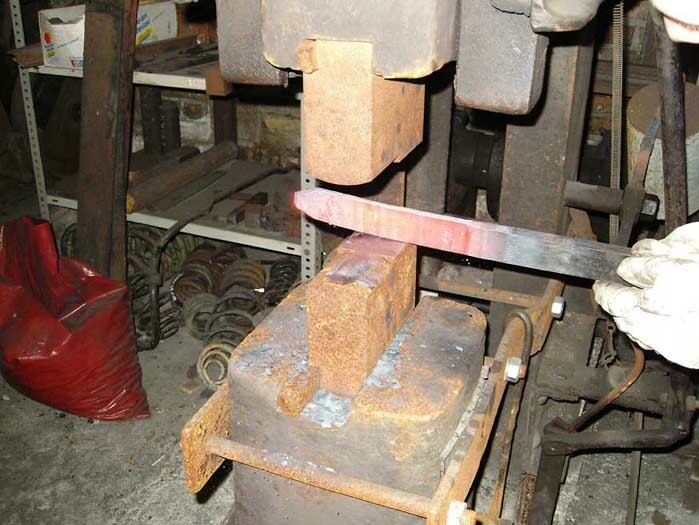 I have got four anvils, but this is not mine, it is Jens Eichler´s, think he has got it from Markus Balbach. 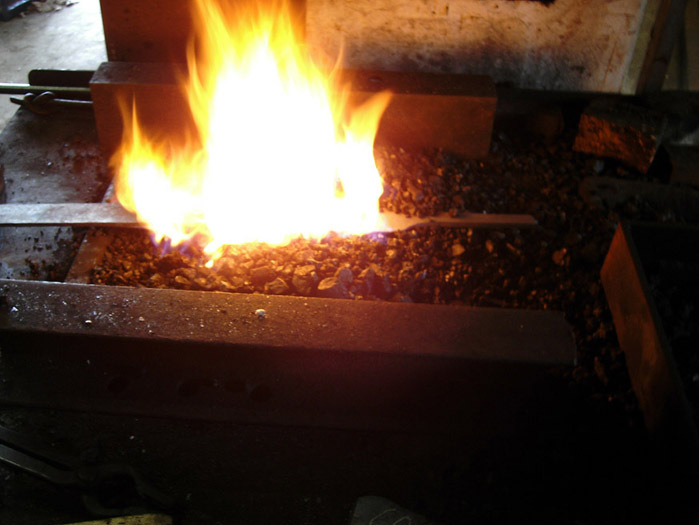 Since he owns a few power hammers, we did this job in his forge. 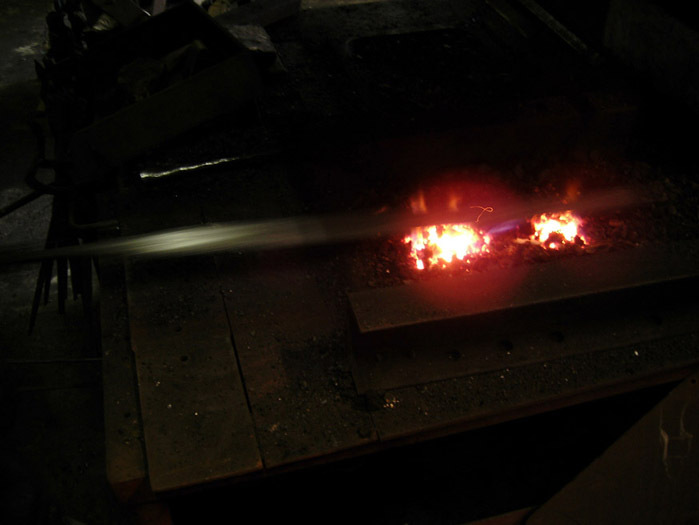 The forge-workshop I normally work in is a museum-forge without those great opportunities... to have done this job there would have meant to forge the steel bar by hand to the full lenght using too many heats for this steel. 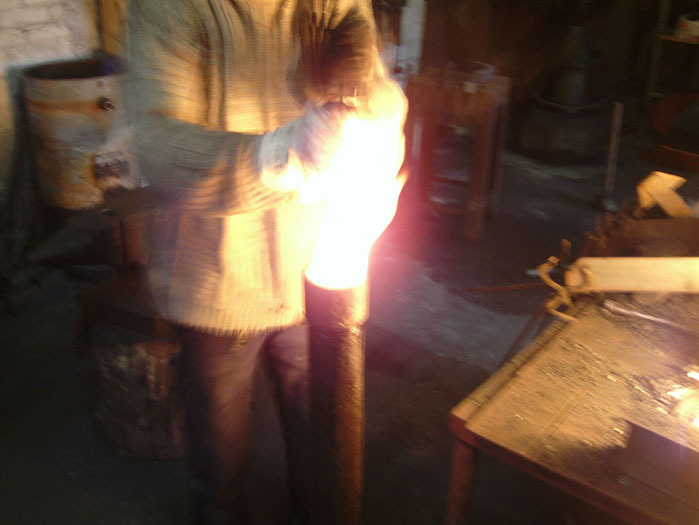 And also Jens has more skill in heat-treating than me...So we can call this project a partnership-project. 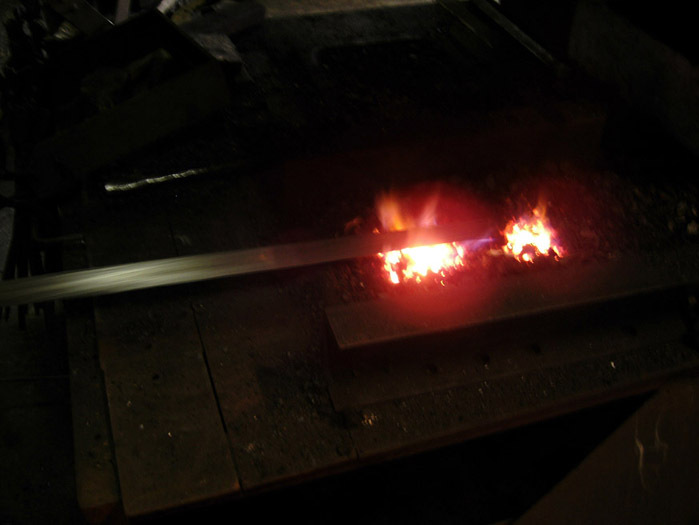 Yes, I hope to see your celtic-germanic sword to be done soon, maybe also with a "making-of"? It would be interesting to compare! 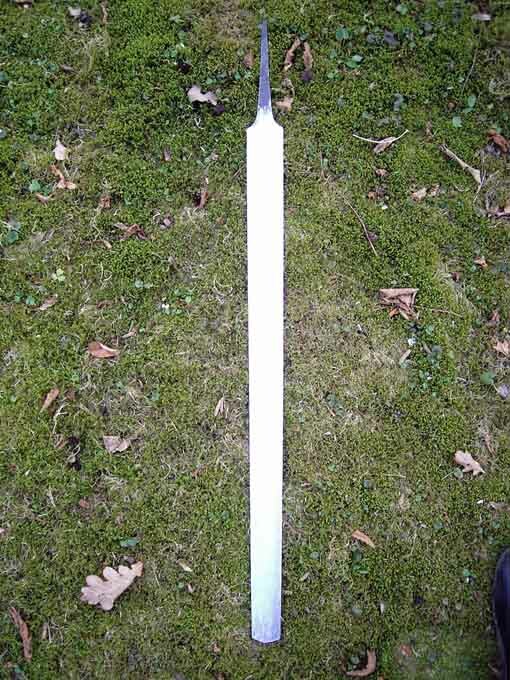 Thanks for sharing those pics christian, that a fine looking sword. I'm looking forward to seeing more from you in the future. 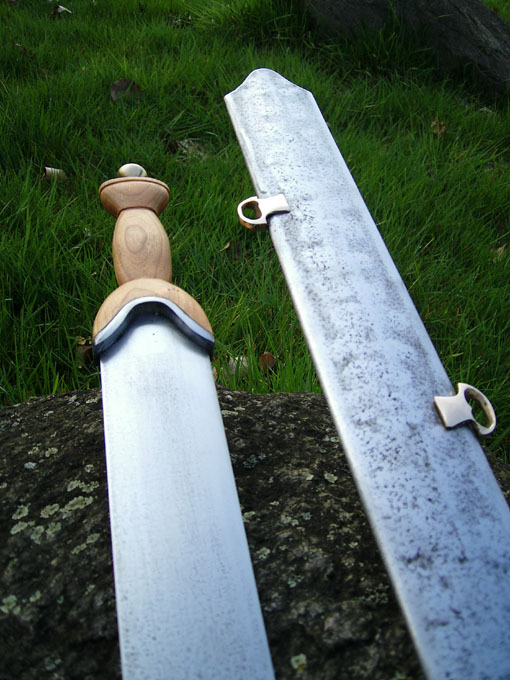 That is the finish germanic late LaTéne-periode sword, based on a find in Nienbüttel at the Elbe river in Germany. weight of the sword: ca. 1000 gr.